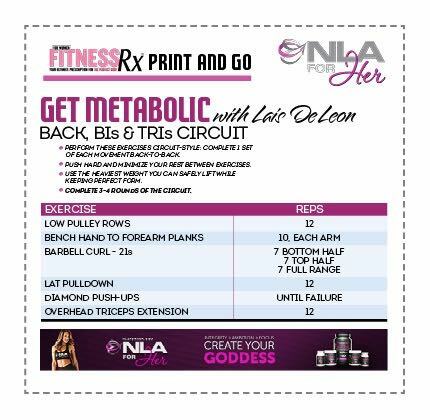 FitnessRX for Women > Training > Print & Go Workouts > High-Intensity Metabolic Blast! Today’s High Intensity Circuit hits BACK, BICEPS & TRICEPS. Watch the video for a demonstration of the workout and top tips from Lais. Then, head to the gym with the handy PRINT & GO Workout chart below and get to work! Let’s do this! Make sure to check out all of the GET METABOLIC Videos Here! A huge thank you to NLA For Her for making these videos possible.